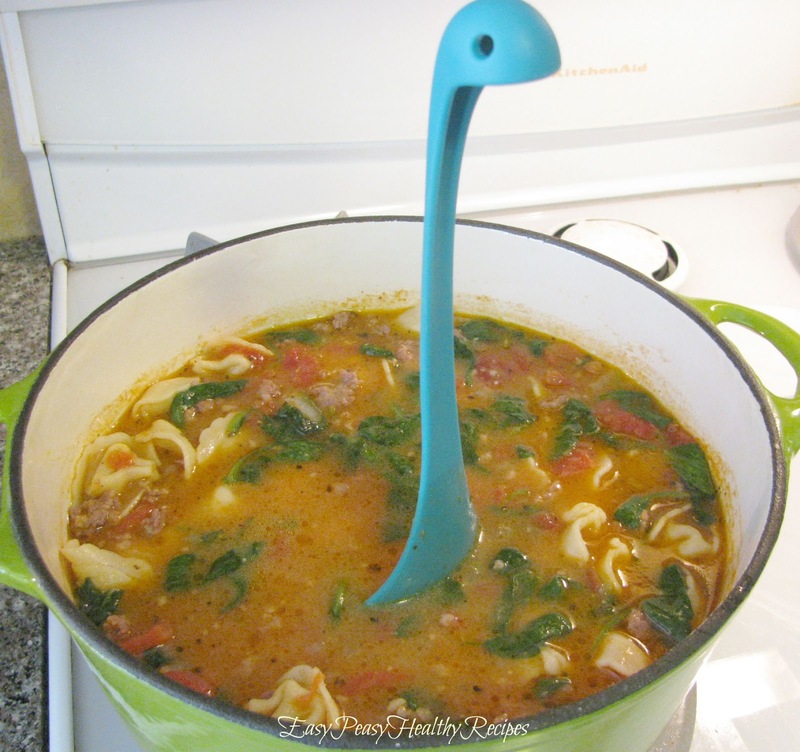 I saw this adorable Nessie soup ladle on Pinterest when it was making the rounds a while back and knew I just had to order one. It was on back order at the time I ordered it and was told it would be months before it would be back in stock but then I was surprised when it arrived after only a two week wait. It appears they have plenty in stock now. I really love how cute and adorable this soup ladle is. Here is a handy link if you are interested in purchasing one for yourself or for a cute gift. They also have one in a pretty green shown below that was not available when I ordered mine. Okay, so now on with the recipe for this delicious tortellini soup with sausage. I usually substitute Italian chicken sausage to make it healthier. I also toss in some more spinach. This one of those great hearty soup recipes that you can really add whatever you personal preferences are. I love how quick and easy this is to throw together but yet it tastes like you worked all day. Super yum! 1. Heat Dutch oven with 1/2 tsp of oil to coat and saute sausage until browned and internal heat is 165 degrees. Remove from pan and slice into small pieces and set aside. 2 .Heat remaining oil in pan, add garlic and saute for 30 seconds, stir in wine and broth and bring to a boil. Cook for about 2 minutes then add tortellini. Cook for another 5 minutes and then stir in spinach and tomato. Cook until the spinach wilts, 2 minutes. 3. Return sauteed sausage pieces to the soup, cook for an additional 5 minutes. I love your food blog. The spoon is so pretty. The recipe is mouth drooling. Thank you for sharing a yummy recipe. Keep posting lip smacking recipe.